We’re giving away a copy of the book here! Jamie Tworkowski is an honest writer. His desire to tell a story of beauty in vulnerability kickstarted the creation of To Write Love on Her Arms (TWLOHA), a non-profit movement “dedicated to presenting hope and finding help for people struggling with depression, addiction, self-injury and suicide.” In the decade since then, Tworkowski’s straightforward essays, blog posts and even tweets have reached millions. Last year saw the release of If You Feel Too Much, his debut collection of writings on topics ranging from Father’s Day to meeting Ernest Hemingway’s great-granddaughter at the airport. Tworkowski’s conversational, friendly tone resonated with readers, who made the book an instant New York Times bestseller and inspired the publisher to release a second hardcover edition this year. The “Expanded Edition” hit shelves during National Suicide Prevention Week, including new material that focuses on a brutally honest subject: heartbreak. 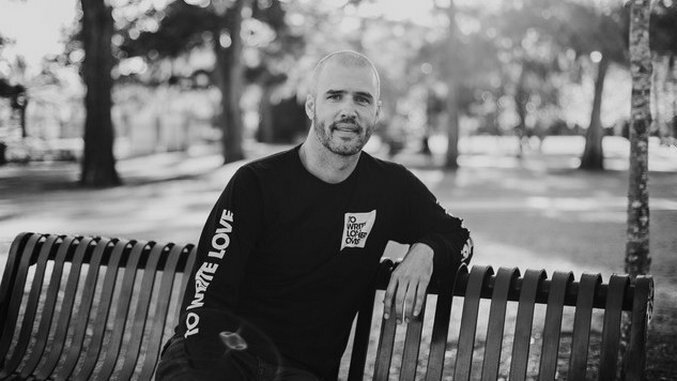 Paste caught up with Tworkowski to discuss his writing about a breakup, his encouragement to aspiring authors and what he’s working on next. Paste: Why did you decide to include new material in the book? Jamie Tworkowski: The publisher asked for new material, so they could release an expanded edition. The tricky part was that I was going through this breakup, and so it was the only thing that I could honestly write about in the time frame that they needed new material. Had they asked me two months earlier or six months later, it may have been different. But I felt like it was the only stuff I could talk about in that season of life. Paste: Did you have any fear when you decided to publish material about your breakup? Tworkowski: There’s definitely some anxiety and curiosity. There was a person it was written about, and I’m curious about her opinion and what other people will get out of it. The hope is that it could be encouraging to someone else who’s going through a hard time or specifically dealing with heartbreak. On a certain level, there was the hope to take something really painful and try to make something beautiful out of it. You have this thing that you don’t know how to let go of, and it meant the world to you. For me, I was trying to capture and remember that. Paste: Does she know she’s in the book? Tworkowski: No. I don’t talk to her anymore, so I don’t know if she’ll read it. I tried to be careful, and I feel like there’s nothing negative in the writing. The hope would be that she would like it, but there’s no way for me to know. I wanted to be careful with her life and her identity and her story. But there’s also the reality that this is part of my story, and one of the unique things about being a writer is that you’re trying to articulate your own experiences. So much of life involves other people, and this was a unique one where I was writing about my life specifically in relation to this other person who is no longer in my life. The million-dollar question is what she would think of that. Paste: What do you hope to write about next? Tworkowski: I don’t necessarily know. I have started to work on the next book, but I don’t know how that will play out. I don’t think the next book or my writing down the road would be all that different. My hope is to keep telling stories, not just from my own life, but from the lives of people that I care about. I don’t know what form that will take in a second book. I just want to be honest. Tworkowski: I’ve had the chance to learn from guys that I really look up to. Donald Miller is definitely one. Jon Foreman of the band Switchfoot—he doesn’t write books, but he writes songs. I have had the chance to get to know guys that I really respect, and I think a common thread, as you mentioned, is the vulnerability. These are guys who are willing to be honest about their stories and their pain. Donald Miller has become a friend, but he is probably the writer that has had the most influence on me and on my writing. I remember reading Blue Like Jazz, and in a way, it gave me permission to be myself as a writer. You can be poetic and honest. One sentence could be funny, the next sentence could be moving. I felt like there was a lot of freedom in the way he told stories, and that resonated with me. Obviously, it resonated with a lot of people, because the book did so well. A lot of people want to meet their heroes, and you wonder what it would be like for your heroes to become your friends. I’ve gotten to experience that. These guys are the real deal. At this point, I’m more grateful for their friendship than for the art that they create. Paste: What encouragement would you give to people who want to write about their own experiences? Tworkowski: The first thing that comes to mind is just to be honest and do it. I’m not a trained writer; I didn’t go to school for it. I don’t know a lot of the rules of writing, and there’s a bit of freedom in that. That’s not to take away from people who are trained or know more about grammar, but to me, we’re all just human beings who get to try our best to make sense of our time here and our experiences. I would encourage people to be honest, and the hope is that they can find their voice. Sometimes people try to sound like someone else or more formal. I try to write how I talk. I really do believe that we’re made to tell stories, and we’re made to be known. I think all of us need that, regardless of writing or even if we’re interested in writing. We all need friends that we get coffee with and we talk about our questions and struggles and things we’re excited about. I don’t think we have a ton of control over the reach of our stories. But we’re called to tell stories regardless. I’m thankful that, even going back to the TWLOHA story that changed my life and led to the organization, I wrote that for me and my friends. There was no reason to believe it would get out in front of people. I just tried to write something that was beautiful and was true. It’s easy to think about the end result and the audience, but I try to encourage people to enjoy the writing and the honesty. I want to believe the rest can take care of itself—that great stories have a way of getting out there. Tworkowski has three more stops on his If You Feel Too Much book tour; you can learn more about the events and where to purchase the book here.